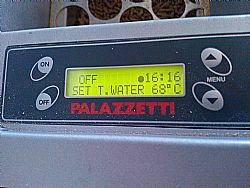 A Palazzetti Ecofire Freddy Ideo internal wood pellet boiler attached radiators and a domestic hot water tank. £4,300 for the boiler plus new radiators and a water tank. A Scottish Community and Householder Renewables Initiative (SCHRI) grant of £1,377. 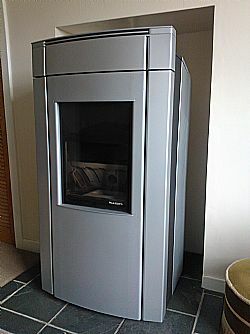 The boiler will not qualify for the Renewable Heat Incentive as it was installed before the start date. It took around 3 months to install the boiler and radiators but mainly because the owner took on a lot of the work himself and because an extension was being built at the same time. The new radiators were plumbed in by inserting them under the floorboards. No issues with smell the fan for the boiler does make a bit of noise but nothing intrusive. The boiler does require an annual service which first year, after this he just repeated the process that the service engineer had done on subsequent years (or when the boiler tells him a service is required). The boiler need dusting down and a vacuum every few days and the ash box emptying every few weeks (which the owner puts in the compost bin). 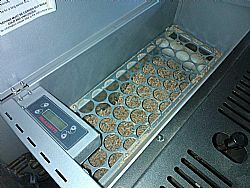 Inside the boiler is a 35kg hopper which holds about three bags of pellets (10kg). During the winter months the owner will manually pour 1-2 bags a day into the hopper (bags are kept in the old coal scuttle). Pellets are ordered by the pallet (~tonne) from The Luxury Wood Company and then the pallet split with a friend (~£240 a pallet or £2.50 for a 10kg bag). The owner has also ensured that the flue has been swept by a chimney sweep every few years. The owner was looking to replace the existing heating system and had a friend who had installed a pellet boiler. The choice of boiler was mainly determined by the dimensions of the unit and the space it had to fit into. The owner finds the system very easy to use and has found that filling it with pellets or giving it a clean down has just become part of everyday life (although he does admit the fine dust that the system produces is not great for the vacuum cleaner and a separate house/boiler vacuum may be useful). He decided after installation that it would be sensible to have a mixer shower installed to utilise the hot water created by the boiler. However, he also left in the existing electric shower for use during the summer months when he doesn’t turn the boiler on (hot water for washing up etc is heated using the back-up electric immersion heater in the water tank). He is not sure on the savings he has made but does remember that there was a noticeable drop in the electric bills after installation.